Breathtaking, isn’t it? But what does it mean? 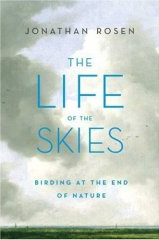 Birdwatching is intimately connected to a journey we all make to find a place for ourselves in a post-Darwinian world. I absolutely agree with Rosen. When I talk about my hobby to people with people not in the know I stress that, for me, it’s impossible to go birding, because I always am birding. It’s relevant in that even in the most urban location, there are always birds, even if the majority miss them. And something as simple as awareness of that fact connects us deeply to that part of all of us that always yearns for a connection with nature (soul or whatever). For me, birding is very much an urban pursuit since I have done most of my birding in urban or semi-urban settings – very often manmade parks with heavily managed habitats – with the aid of modern conveniences such as public transportation and good binoculars. They’re wild enough to avoid the feel of a theme park or zoo, but not fully natural. Places that are truly wild are few and far between these days. Even rural birding sites are not fully wild. Birding is also a modern practice because our interaction with birds has changed enormously within the last hundred years or so. In pre-modern and early modern contexts, if you went out to look for wild birds, you were looking to hunt them. The rearing and killing of birds for food now takes place mostly on factory farms – out of sight and out of mind for most people. So we’ve replaced hunting wild birds for food with hunting them for watching, contemplation, or list-building. When I am stressed out nothing calms me down like sitting on a rock and looking at birds. And few things are as exciting as seeing a new or very rare bird. I’m not about to buy into the whole “soul” thing but I will say that I seem hard-wired to respond to the natural world in a way that, if I didn’t have a basic understanding of evolution, might lead me to believe a soul was involved. I don’t think it is very far-fetched to think our hunter-gatherer ancestors spent time watching birds for the pleasure of watching them and not just to figure out how to get them in the cooking pot. Rosen’s thesis is that the veil between modern human beings and their wild origins is far more thin than we ordinarily think it to be. However we have, by our centuries of “civilization” been robbed of the awareness of our dormant instincts and even our very physical capacities to survive in the wild, thus ironically our mind connects with memories buried deep in the primitive brain that recall our need to be in touch with nature while our technology that seperates us from it at the same time is necessary for us to reach into it to experience that from which we are now alienated. The pursuit of bird observation is the trigger by which these repressed memories are brought into our consciousness, hence we are drawn to it for reasons not always apparent yet unable, in some of us, to be overcome. came to mind this week, when I heard the story of a young man lost on a snowmobile trip during a blizzard in northern Manitoba. He was out there walking for four days before finding his way to a road and rescue. He spoke of ravens who appeared each day of his journey and how they helped him keep hope and feel like he wasn’t out there alone, and they are of course a very powerful symbol in aboriginal culture. Many of us have a bird that is a symbol of something deeply personal to us, and it is amazing how that particular bird may appear at a time when we need a symbol of hope to feed our soul and connect us with the rest of humanity, no matter how alone we may be feeling. When I think of the word “soul,” I think of that part of the human that truly defines who you are and what you think, what you want/desire and where you want to be. But, due to the constraints of the modern day, we don’t always “get in touch” with our soul. Despite the fact that we all hustle and bustle to our daily heres and theres, and despite the fact that none of us will give up our lives of hustle and bustle, deep down, I believe most of us (or, at least, many of us) “remember” (or romanticize) a simpler time when our day was less constrained. Haven’t we all watched the bushmen in southern Africa and felt, at least during the most stressful times in our lives, that it would be nice and somewhat relaxing to have that “back to nature” lifestyle? In contrast to our busy day, it looks rather stress-free (and happy!). And that’s where birding comes in. It’s such an easy “retreat” to the simple world. Like an earlier commenter said, birds are everywhere. No matter where you live – in the big city, in the country – you have birds, even if the majority of people don’t see them. And, unlike all of the other animals we see daily, few (if any?) exhibit the pure freedom and carefree-ness of the bird. They can pick up and take to the wing and be seemingly halfway around the world in seconds. I’d like to see a deer, rabbit, fish, or other “everyday” creature do that! That’s freedom! That is luxury. That is how you “get away” from the day-to-day in a hurry. Plus, there are so many different birds it almost brings out our inherent competitive nature to see how many we can see and count. Try that with rabbit or deer. Uh, there’s one. They all look the same to me! Birding just puts it all together. And since birders can combine other art forms with their work (artistry, photography, etc. ), there is no end to the amount of different ways you can enjoy it. Again, it brings to mind the freedom of the bird. No work, but they are taken care of (of course, we know how hard some birds work ! ).